I was asked elsewhere in another syndicated post. "David, Obviously you do not entirely believe your own line of argument… How do the actions of Iran’s regime represent the attitudes of its people? When has Iran ever faced either east or west? It seems to me that it has always faced in both directions. I do not understand what people mean when they make these statements." "It's a perspective among many, a corner to occupy to see how things look. To answer you, the regime manufacture their own following, like many nations so one can't easily say how the attitude correlate. An example would be the near unanimous agreement that stricter hejaj is needed - strange comment to publish in itself but supposed agreement/representation. I'm sure that in many cases the people are further right (read strict) than the government, concerning capital punishment or views on Israel, but I cannot support this. It is difficult to represent Iran when living in Tehran, I've traveled a fair bit around the country and the Islamic Jurisprudence is not unwelcome outside of the open minded capital. Forgive me for taking a relative point of view on this but I'm sure the Iranians are equally as represented as the Americans by their government. Regarding facing East or West, by this I mean economically. The West might represent anything NATO, with a view to maintaining economic dominance through institutions such as the IMF, World Bank and WTO, backed by dominance in the UN and outfits like the G8. Clearly Iran is not facing West in this sense as can be seen by sanctions and repeated (internationally illegal) threats. Iran will associate with the above mentioned institutions but is rather (uniquely) direct about its desired involvement. Not excepting IMF hand-outs is sensible but Iran is strong enough to avoid these traps - unlike certain European nations that felt the wrath when they held such a view. As for facing East, one can observe the subtle glance in this direction by recent trades with China (energy) and Russia (technology) - both nations with permanent seats in the UN and part of the G8. These emerging powers with India will want to break the unjust global economic situation and help their rapidly growing nations. Iran is a hugely important player in this, more so for location maybe than resource. But the game is still being played and my feeling is that Iran is hedging it's bets - or might even be the decisive piece on the board. Each player is not wanting to be seen to be making a play but the necessity is increasing for people to make moves. It is inevitable that America will decline in power and dominance, rather soon I feel, but when they hold all the guns and tools for control, it's difficult for nations to be open on intentions. Yet also, both China and Russia have a lot to loose by forging a Eastern ruling block - for now at least. My guess is that as situations develop the ease at which these nation can state a view will be brought about by economic sensibility. How this fits to the local picture is that I feel Iran has become a some strange post-modern representation of itself in this evolving game. I feel that the government is beyond a lot of the early rhetoric yet keeps this for many local and international reasons. Some of this is to appease the British links and some of it is an easy means for saber rattling - I'm sure there are many further examples of how this works for now. Citizens are in the regard of the governments, be it Iran or America, but not as individuals I feel. There are mutual benefits to be gained in individual's welfare, but it would rate behind a great many other factors I would add. Some activities might coincide with the attitudes of the nation others won't - this goes for all nations. Some nations have great ways to merge the two, others don't. We cannot possibly know the extent to which these are or why sometimes it fits and sometimes it doesn't. The structure of nations means individuals cannot know and will likely never know. I feel Iran will emerge and adapt, it will fit a new developing order and thus represent it supposed views is some comfortable transition. I feel this will appear less extreme and less associated to religious doctrines and as I say in my post - we will be allowed to progress. I'm certain the government know they have to evolve but they must do so in a way that doesn't bring the nation to its knees before unjust dominance - the American empire. Hey man, doesn't sound like you're having such a good time out there lately. Chin up, and don't fall down any random holes. Anyway, I've recently discovered something that kind of adds to your point above. 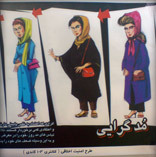 After the Islamic Revolution, the paranoid Islamic Revolutionaries did all they could to encourage increased fertility, hoping to breed an "army of Islam" that would repel any invaders. But as time went on and the Revolution settled down, they began to implement more sustainable policies. Iran is now home to one of the world's most successful population-stabilisation programmes - all entirely voluntary, involving subsidised contraceptives and fatwas encouraging contraception and family planning. The "youth bulge" left over from the fertile 80s will take a long time to work itself out of the system, but Iran is already down to 1.2% annual growth and is seen as a model for developing countries. I very much doubt it's a coincidence that the only other country to so successfully stabilise population growth (albeit in a much more heavy-handed manner) is China - like Iran, never fully colonised and, like Iran, very defiant towards the neoliberal "new rulers of the world". Maybe I've got this a bit mixed up, here (http://www.mnforsustain.org/iran_model_of_reducing_fertility.htm) is my source anyway, the data only goes as far as 2000. I think you're exactly right, for all its (many horrible) flaws the IRI regime is if anything more representative of its "electorate" than the UK/US equivalents, and standing up to the latter gives them a chance, at least, to go in a positive direction. Cheers Dave for the comment, it's a pleasure to have you here. Iran is rather peculiar in the respect of good and bad policy. I hear the country being praised for its efforts with controlling drugs problems and like you the demographics. Ha, I live in a record young nation, with the highest female to male education ratio - we're all under 30 (I won't be for much longer), it's a strange place to be in that respect. Demographics is a funny things, maybe the crux of many global issues. Israel/Palastine what with the procreation rate between the two. The UK I find interesting and other nations around Europe - I can't support this but I rather feel the immigration debate is rather lacking in honesty. Does Britain not disparately need to increase its birth rate to keep the system functioning - for which immigration seems like a great answer... but the racist response - yikes! As for me, I'll live, it's not that bad - just few places and people to vent with and thus this place gets it - hope it doesn't bore. Lastly, the Neo-Liberal bullies - this one will be the big headlines as they zero in. I don't see the guys here swaying - nor do I want them too, give me these black hats over those rotten souls. Don't worry, I'm all for blogging as bitching; Surrey will continue to get it in the neck chez moi and I bet it doesn't even compare to Tehran. Then again, my little brother once told me back that if he could go anywhere he'd love to go to Iran because, being the land of the under-thirties, it must be a great party atmosphere. In practical terms, migration from youth-bulging poorer countries to greying richer countries is an obvious win-win situation, but knee-jerk communalism isn't having any of it. To stem the "flood" of people with funny names and skin colours, some European governments are actually trying to increase the "indigenous" birthrate. I think Britain has so far been spared it, but Spain and France are now paying their women to squeeze out the babies.